The vasomotor center integrates information from sensory receptors that monitor various cardiovascular parameters and sends efferent commands to regulate cardiac function and arteriolar tone. Vasomotor tone is a partial state of vascular smooth muscle contraction sustained by continuous repetitive firing of sympathetic vasoconstrictor fibers. Baroreceptors are stretch receptors that provide the central nervous system with information regarding the blood pressure. The firing frequency of the baroreceptors is proportional to the pressure applied to them. The baroreceptor reflex allows the vasomotor center to respond to a reduced arterial pressure by increasing the firing rate of sympathetic vasoconstrictor fibers to the arterioles so that peripheral resistance increases. The carotid baroreceptors monitor arterial pressure within the range of 50-200 mm Hg, whereas the aortic baroreceptors monitor pressure between 100 and 200 mm Hg. The baroreceptors adapt to increases in arterial pressure after 1-2 days; hence, the barorecep-tor system does not contribute to the long-term regulation of arterial pressure. 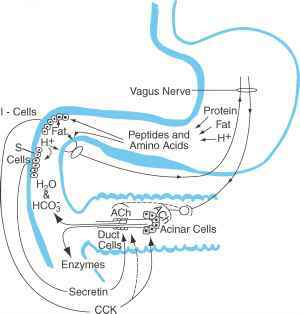 Low-pressure receptors in the atrium help control blood volume, rather than blood pressure, through the reflex release of antidiuretic hormone. The reduced fluid loss from the kidneys initiated by antidiuretic hormone increases blood volume and consequently raises blood pressure. Changes in the chemical environment within the carotid and aortic chemoreceptors activate the vasomotor center to elicit vasoconstriction when arterial pressure falls below 80 mm Hg.